Pierce Manufacturing, Inc., the maker of the ladder that fell while in use by the Boston Fire Department while fighting a fire in Mattapan on Wednesday, has issued a response to the incident. The accident has not been fully looked into by authorities. The company states that initial investigations reveal this was an incident that has not occurred before with the 2005 reserve equipment. 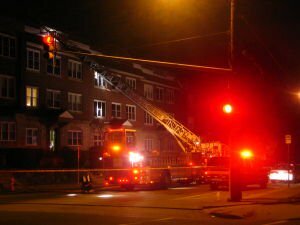 The Wednesday evening fire started in a triple floor, multi-family dwelling on Duke Street. There was thick smoke on the top floor when firefighters arrived on scene. The faulty equipment was part of Tower Ladder 10 where the ladder fell onto the home. The fireman in the bucket at the time descended a few feet, and risked severe injury if the ladder’s fall was not stopped by the home. According to Boston Fire Commissioner Joseph Finn, their equipment is well maintained by the department. Prior to sending it out for service, no one noticed a problem with the ladder. A products liability accident occurs where there is a defect in the equipment, or a defect in the intended use of the equipment. Proper use of the equipment which still results in injury makes the manufacturer liable. If you have been injured due to a piece of equipment that malfunctioned when following manufacturer’s instructions, you may have a personal injury case. Call the Law Offices of Jeffrey S. Glassman at (617) 367-2900 and tell us your story. Pre-existing damage to the turntable console that houses the ladder controls. A new , “neutral” position had been hand-written next to the RAISE/LOWER control lever on the console. Damage to the linkage on the RAISE/LOWER valve. The linkage was both bent and loose. This damage prevented the ladder from maintaining its position when the operator released the control valve, after positioning the ladder at the fire scene. In effect, the damaged control system lowered the ladder onto the building, resulting in the damage to the ladder.